Charity, comedy and disability: a potentially volatile mix. But strangely, there weren’t many times during the planning of ‘End the awkward’, Scope’s new awareness campaign, when it felt like we were taking a huge risk. As more of the pieces fell into place – the research, concept, scripts, director and narrator – our confidence in what we were doing grew. The campaign launched on 8 May and so far (it’s early days after all) that confidence seems to have been justified. Our ads have been viewed 300,000 times on YouTube, attracted some great media coverage and received an overwhelmingly positive response. The process of developing the campaign started about a year ago. It has been immensely rewarding, but not without its challenges and tough decisions. Scope is a household name but we’re perceived as a non-specific charity. When people are asked to list disability organisations, only around six per cent name us (most people can’t name any). We needed to create a stronger link with disability and address the issue of our brand recognition. Above and beyond that, disability issues tend to struggle to get the public attention they deserve. We’ve done research into public attitudes over the last year and found the public tends not to engage with disability issues, and disabled people, because of fear of saying or doing the wrong thing. Younger people are twice as likely to struggle with this. Looking at the research and working with our creative agency, Grey London, we identified this ‘innocent ignorance’ as the issue we needed to tackle to get disability and Scope on people’s minds. We chose to target a 25-30 year old metropolitan audience. As well as tackling the age group with the highest ‘awkwardness’, this gave us the opportunity to be quite brave in our approach. From the moment Grey presented us with their initial set of concepts, ‘End the Awkward’ stood out as the one with greatest potential. Our focus groups and testing supported this and with our board’s approval secured we began working on content earlier this year. Comedy felt like a good way to take on the subject matter without coming across as preachy or paternalistic, but we knew we had to tread carefully, particularly around how disabled people were represented. Keeping in contact with a group of disabled stakeholders throughout the production process helped to inform our decisions. Among other things, we expanded our narrator, Alex Brooker’s role based on their feedback – so a disabled person was the central focus. It was also important we didn’t end up just playing for laughs. We wanted the ads to have warmth and humanity as well as humour, reflecting the ‘innocent ignorance’ we were addressing. The director we chose, Jeff Low, included a lot of Cohen brothers references in his pitch, which was a good sign he would get the balance right, in my opinion at least! Balance was also important in our choice of media. We wanted the exposure and PR value of some TV advertising, but knew the best way to target our audience was through online, video on demand and cinema. Budget was limited so the bulk of our media spend went on these three areas, but we did choose to premier the ads with a single day of TV advertising. After almost a year of hard work, we launched the campaign on 8 May. We picked up some strong media coverage – including Metro, Good Morning Britain and Sky News. The ads were shown on Channel 4 on 11 May and promotion through other media channels began the day after. We developed a set of supporting content including tips to end the awkward on our website and are adding to this as we focus in on different themes throughout the campaign, like awkwardness at work. So far, these pages have been visited by over 80,000 people. We’ve designed a supporter journey for people who give us their data (mainly through our awkward quiz, which has been our main call to action). At the moment, about five per cent of people doing the quiz leave us an email address, which we think is a pretty good conversion rate. And we’ve cultivated a lot of conversation online – #endtheawkward has been used almost 5,000 times already. While we’ve been really encouraged by the response so far, we won’t know if we’ve been truly successful for a while yet. We’ve benchmarked levels of semi-prompted awareness among the target audience and will be testing this again in the summer. We hope to see at least a one percent increase. Most importantly, we want non-disabled people to feel more comfortable with disability: harder to measure, but hugely important. If we achieve that on any level then it’s a step towards a better society – which is what we’re here for after all. 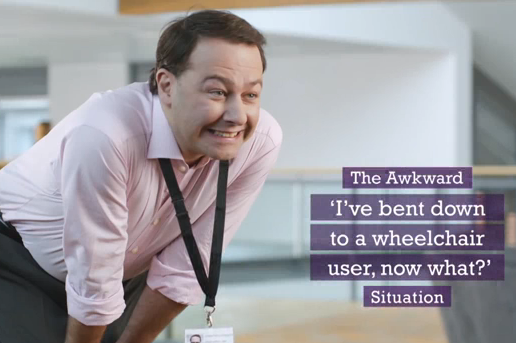 Want to hear more about Scope’s End the awkward campaign and how the charity identified and targeted its key audience? Mark Atkinson, director of external affairs, will be talking about segmenting by demographic and attitude at our next conference. CharityComms member Scope is a UK charity that supports disabled people and their families in England and Wales. Their vision is a world where disabled people have the same opportunities as everyone else.